What the cluck? I mean how could anyone resist putting that phrase on a banner and stringing it above the entrance to a chicken restaurant. This post is focused on puns used by businesses to enthrall, entertain and inspire us to become customers. It seems only fair to consider what a pun is and isn’t. My big, red dictionary, a gift from Mrs. Reser years ago, defines it as the humorous use of a word in such a way as to suggest different meanings or applications or of words having the same or nearly the same sound but different meanings. This definition will be applied to see how well these puns work. While it seems like a good pun may depend on a person’s sense of humor, the idea of puns used by businesses have the potential to be the kind of stuff that would cause viewers of Good Morning America to spit their coffee in hysterics. Puns are big business. They create smiles. They help people remember your business and get people talking about it. Making people happy creates a desire to spend money. Puns will make you rich. Use them to spread joy and good humor throughout the world. Be clever with the language, and the people of earth will laugh along with you and throw money at your feet. Somehow, in all that, I managed some pun free copy. So, brace yourself, a pun overdose is about to kick in. How can you not appreciate a pun that references profanity? It employs bad taste with good humor. 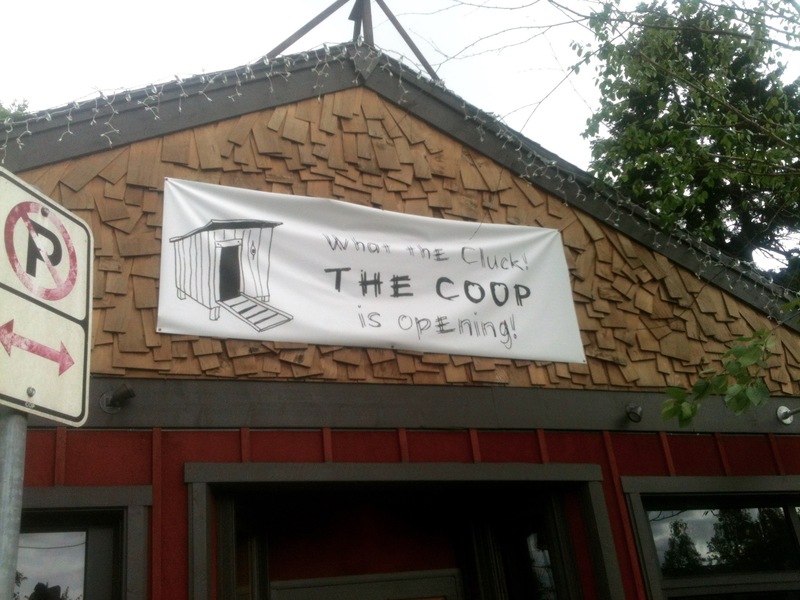 “What the Cluck?” is the right message for a banner on a chicken restaurant. It sounds like what chickens actually already say to each other in the barnyard. Shih Tzu has always been a funny name for a dog breed and, as I learned from auto-correct, hard to spell without using profanity. I originally left out that pesky silent “h.” The word has a sound halfway between a swear and a sneeze which suits this type of dog well. 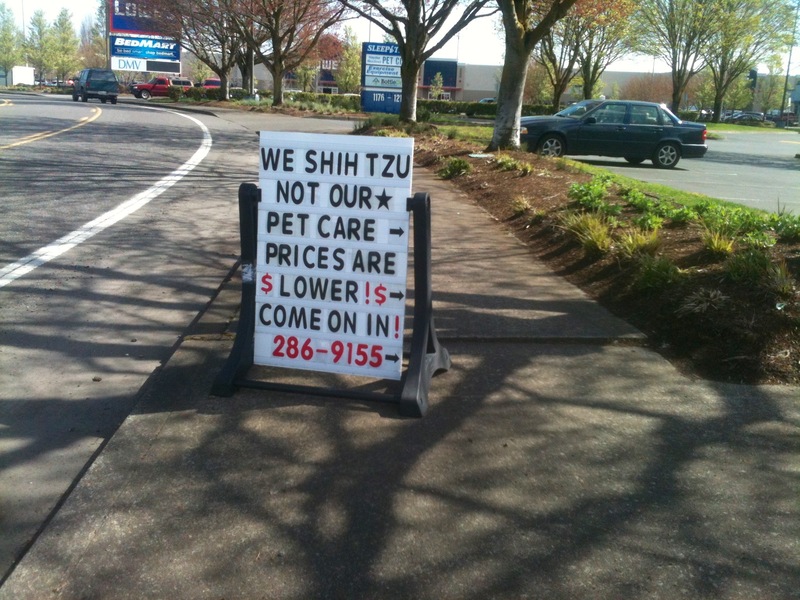 This sign was spotted outside a Vet’s Clinic at Hayden Meadows where it sure seems like you’ll have a good chance of working with a veterinarian that will laugh with your pet instead of at it. 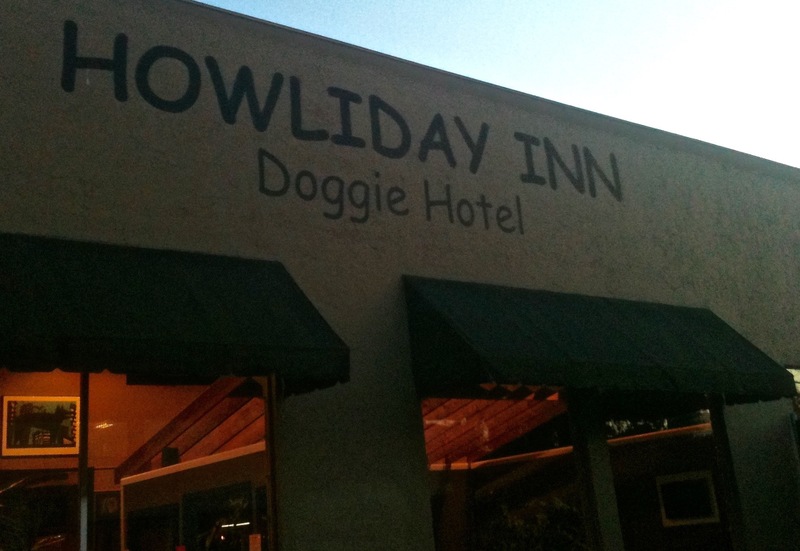 In the Central Eastside business district you have a doggie day care facility/hotel with a clever name. I have to digress by saying that I can’t say dog day care, it always has to be doggie for some reason. The business name seems to be a combination of a reference to a Bing Crosby movie and the reaction guests have when their owners drop them off. Yes, you might end up expressoing yourself especially if you speak with an Italian accent. 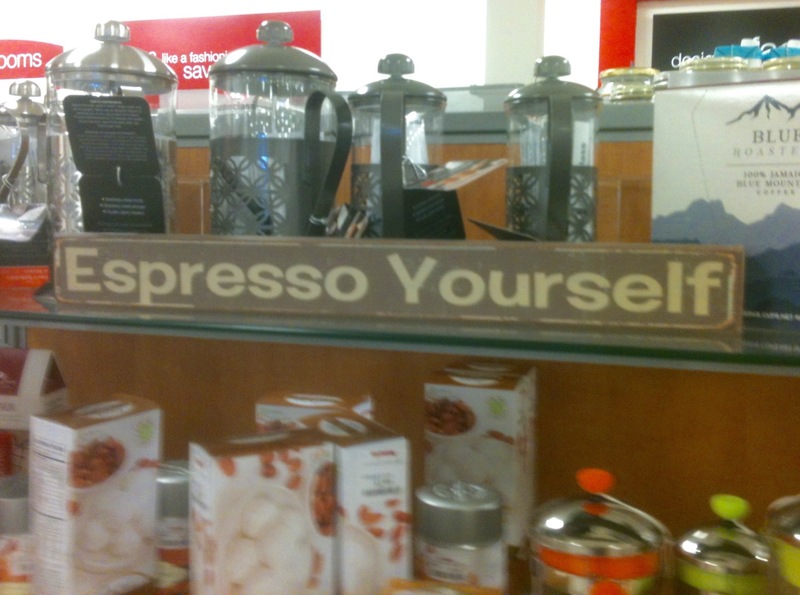 You may well express yourself better if you drink expresso. A sign at the T.J. Maxx keeps it simple and begs you to buy the sign, take it home and hang it in your kitchen above the coffee maker. A sandwich board outside of Posies goes for the gold. In fact, I just caught the last pun by studying my photo extra hard. The message ends with, “It’s a latte” and it is a lot to take in. To translate, the sign says: “I can’t express how much you mean to me, but I can try. It’s a lot.” By now you know how puns work so you’ve, or I have, figured out that the keywords are words pertinent to coffee shop nomenclature. It’s a colorful sign too. It inspires me to want to drink expresso, coffee and possibly a latte. 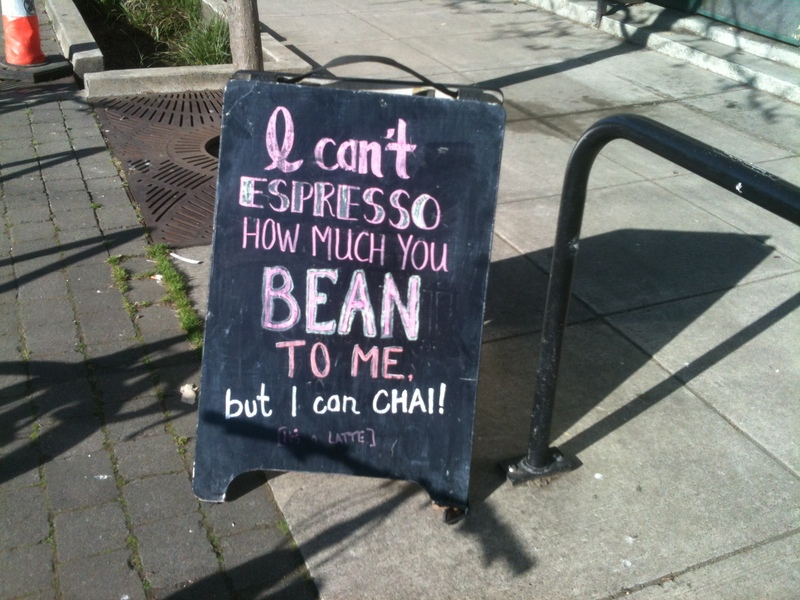 I’ve never been much of a chai person. If you spend anytime at all at T.J. Maxx you may find strange objects mixed in with bargains. You might try to imagine for them a new owner and where and how this person might use the door knocker in a bikini or the grill cleaning brush with a gorilla sculpted into the handle. It might seem like it would take a lot of imagination. Consider this spoof of the second greatest line to come out of “Jerry Maguire.” Not to be out-shined by all the cute kid antics, Tom Cruise and (don’t forget) Renee Zellweger, was the script with a couple of famous lines. When a mixed-up in love character played by Renee Zellweger delivered the line,“You had me at hello,” no one was able to resist repeating it, spoofing it and mangling it for the rest of the 90’s and possibly beyond. 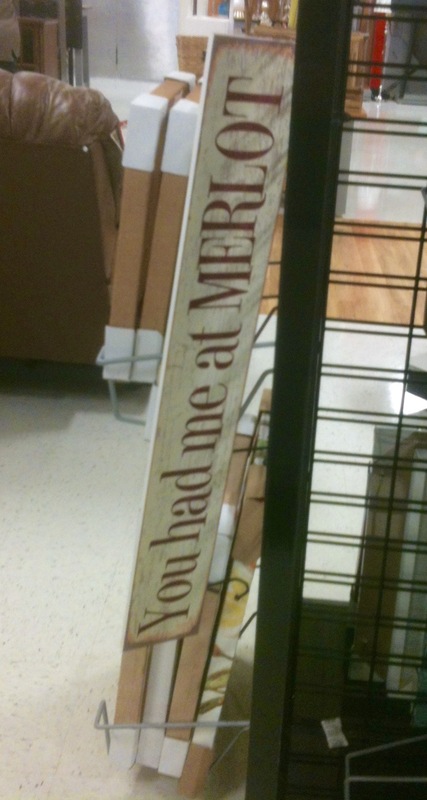 “You Had Me at Merlot.” Is it even a pun? I don’t know. I’ve gone insane. It’s the sign version of a wine bottle upside the head. Nevertheless, it is nice to think that you could buy something like this and hang it in your wine cellar because the joke would never get old.